Here you’ll find the answers to a range of questions you may have about Smartbox gift boxes. Whether you’ve just received a gift box, are ready to use one or would like to place an order, we are here to help. A Smartbox is the gift you live! Each gift box gives its recipient the opportunity to select an experience of their choice. With a wide range of experiences to choose from, it’s the perfect alternative to a material gift. The Smartbox gift box is also available as an electronic version (e-Voucher), delivered via e-mail. Have you received a Smartbox? Click here to get started. An e-Voucher can be used in exactly the same way as a physical gift box. To access the full list of experiences available, you should register your e-Voucher to your personal account. This will also give you access to online reservation and exchange, and protect you from loss or theft. Where can I buy Smartbox products? All gift boxes are available online via the Smartbox website. You can browse the range, place an order and pay using a range of payment methods. How long is my gift box valid for? Your gift box is valid for a period of two years from the date of purchase. The easiest way to check the validity date of your gift box is by registering it to your personal account. How do I check the validity date of my gift box? To register your gift box, enter your voucher number and confirmation code in the fields provided (Where can I find this information?) and select Continue. Log in to your existing account or create a new one following the on-screen instructions. I want to renew my gift box, what should I do? To renew your gift box, you will need to complete an online exchange. All you need to do is exchange your current gift box for an equivalent gift box or new gift box of your choice. You can complete an online exchange via your personal account. Your new gift box will be valid for a period of two years from the date of exchange. For more information on the online exchange process, please see the question: How do I exchange my gift box? My gift box has not been ‘activated’, what should I do? For security reasons, gift boxes are activated after the time of purchase. If the gift box was purchased online, it will be activated within 30 minutes. If the gift box was purchased in a store, it may take up to 24 hours for it be activated. If the relevant time period has already passed, please send a copy of your proof of purchase to info-ireland@smartbox.com along with your gift certificate number. How and why should I register my gift box? To register a gift box click here and enter your voucher number and confirmation code in the fields provided. What is the Smartbox loss and theft guarantee? Once you register your gift box to your personal account, you are automatically protected against the loss or theft of your gift certificate. If your gift certificate is lost or stolen, and provided it has not been used in the interim period, you can exchange it for a new gift box via your personal account – this will deactivate your missing gift box immediately. Please note, a new gift box can only be issued to the person who registered the original gift box. I have a promo code – how can I use it? To use a promo code, simply enter it in the field marked ‘Promotional code’ during checkout. Once you select ADD, your promotional code will be added and your order will be updated. Please note, you can only use one promotional code per order. I placed an order via the website, can I cancel or modify it? Once an order is placed it cannot be cancelled or modified because it is already being processed. However, you can withdraw from the purchase of a gift box (purchased online) within 14 days of receiving your order, without having to give a reason or pay a fee. Please contact Customer Service to request a refund. Also, please note it may take up to 14 days for your refund to be processed. Select PayPal when choosing your payment method. You will then be prompted to log in to your PayPal account. Is the online payment process secure? Payments made via our website are managed through the online payment solution Ogone. This means that your card information will not be communicated to us at any stage of the transaction. The transmission of payment information is protected and encrypted using the Secure Socket Layer (SSL 3) protocol, which is, to date, the safest and most commonly used means of e-commerce. You can make online payments via our website with complete peace of mind. I have a Smartbox credit, how can I use it? Your Smartbox credit can be used to purchase items on our website (excluding shipping costs). Insert your 9-digit Smartbox credit code and your 3-digit activation code in the fields provided and select ADD. The cost of your order will now be updated. I placed an order and require a VAT invoice, what should I do? To request a VAT invoice, please call us on 01 485 4016 from the Republic of Ireland. If calling from Northern Ireland, please call us on 028 9568 0052. Please have your order number ready when you call and allow 7 days for your request to be processed. Guest Checkout is a quick and easy way to purchase a Smartbox without having to log in or create an account. When you are making a purchase, if you don't log in or create an account, you will automatically be taken to the Guest Checkout page when you select to place your order. Once complete, you will receive a confirmation email detailing your purchase. Can I use my Smartbox Credit when using Guest Checkout? Yes, all Smartbox payment methods are available when using Guest Checkout. I purchased a Smartbox using Guest Checkout, why does it not appear in my account? When you used Guest Checkout, you were not signed in to your personal account. As a result, your new gift box is not yet associated with your personal account. Once complete, your Smartbox will now appear in your personal account. I did not receive a Confirmation Email after using Guest Checkout. What should I do? Please contact Customer Service and a member of our team will be happy to help you. What delivery methods are available? I ordered an e-Voucher, when will I receive it? Once you place your order you will receive a confirmation email. This email does not contain your e-Voucher but it does contain a reference number beginning with ‘SIECOF’. You will receive your e-Voucher via a second email within 30 minutes of placing your order. If you do not receive your e-Voucher within two hours, we advise you to check your email account’s ‘Spam’ or ‘Junk’ folder, or the ‘Promotions tab’ if you have a Gmail account. Can I order a gift box and have it delivered to someone else? Yes - we can deliver your gift box to the address of your choice. To do this, you must enter the recipient's address as the ‘delivery address’ when placing your order, which in this case will be different to the billing address. Your shipment can also be personalized by adding a message to the recipient for free. We recommend that you carefully check your message before completing your order as it will not be possible to change it once your order is complete. Yes. As soon as you place your order you will receive an email containing your order reference number, which begins with ‘SIECOF’. Once your order is dispatched, you will receive a second email containing your parcel number and a link to track your parcel. Please note, it may take several hours for dispatch to take place after you place your order. If you don’t receive an email with your tracking number, please check your Spam/Junk folder. If you ordered an e-Voucher, please see the question: I ordered an e-Voucher, when will I receive it? Where can I find a list of the partners included in my box? There’s a partner in my booklet that doesn’t appear on the list in my personal account. What should I do? How do I book a getaway or an activity (pampering, gourmet, adventure)? You must book your getaway or an activity directly with your chosen partner; just let them know you're booking with a Smartbox. You can find their contact details within your booklet, or by checking the complete list of partners available with your gift box via your personal account. I would like to extend my getaway can I reserve extra nights? When reserving with the partner inquire if it is possible to book extra nights and/or rooms. What time should I arrive on the day of my reservation? Check-in times will vary from partner to partner. You should check the details of your booking via your personal account. I made a reservation but I need to change or cancel it. What can I do? To cancel or change a getaway or an activity you must contact the partner directly. Please note, the ability to amend or cancel your activity will vary depending on the partner's cancellation policy. I want to book an activity but I can't find a partner with availability, what can I do? Many of our activity partners are small businesses and may not be able to respond to your request as promptly as you would like. We recommend that you contact the partners at different times throughout the day and if possible leave a message for them to call you back. Are there any special conditions that apply to Activities? Most activities offered by our partners do not carry special conditions; however, a small number of activities may apply age, weight or height restrictions, or may not be suitable for pregnant women. We recommend that you check the activity information available on the partner's page via your personal account. Can my children accompany me on an activity or getaway? All our gift boxes offer getaways and activities for a set number of people. Depending on the partner’s availability, it may be possible to add additional people to your booking for an extra fee. We cannot make these arrangements on your behalf so please contact the partner directly to make your request. Can I bring a pet when I attend an activity or getaway? The admission of animals is not permitted in all establishments. For more information, you should check the partner's page via your personal account. If the required information is not available on the partner's page, please contact them directly via the contact information provided. Can I exchange my Smartbox? You can exchange your gift box for a new gift box at any time during its validity period. You can exchange your gift box for an e-Voucher of equal or greater value, or a physical box when available. A €10 handling fee is applied when you exchange for a physical box. The easiest way to exchange your gift box is online via your personal account. If you haven’t done so already, you will need to register your gift box to a personal account to begin. If you would like more information on how to make an online exchange, please see the question: How do I exchange or renew my gift box? If you are ready to begin the simple three-step exchange process click here. Can I renew my Smartbox? You can renew your gift box at any time during its validity period, subject to availability. To renew your gift box, you need to complete an online exchange. Using this process, you will be able to select a new or equivalent box. The gift box you select will have a new validity date of two years from the date of exchange. If you are ready to begin the simple three-step exchange process, click here. Please note, you will need to register your 'new box' to your personal account to be able to use it. For details on the online exchange process, see our question: How do I exchange or renew my box? My gift box has expired, can I still exchange or renew it? It's possible to exchange or renew a gift box within 6 months of its expiration date but a fee of €10 will be applied. To begin the simple three-step process click here. We’re sorry but it’s not possible to exchange or renew a gift box that expired more than six months ago. We apologise for any inconvenience this may cause. Can I exchange my physical gift box for an e-Voucher? Yes, you can exchange a physical box for an e-Voucher by using our online exchange process and selecting an e-Voucher as your preferred format. If you haven’t done so already, you will need to register your e-Voucher to a personal account to begin. Can I exchange multiple boxes to one box or vice versa? You can exchange multiple vouchers to one through your personal account. However, exchanging one voucher to multiple vouchers is not possible. Click here to access your personal account. If you have not yet registered your gift vouchers, please complete the registration first. Click the Exchange button next to one of the gift vouchers you wish to exchange. 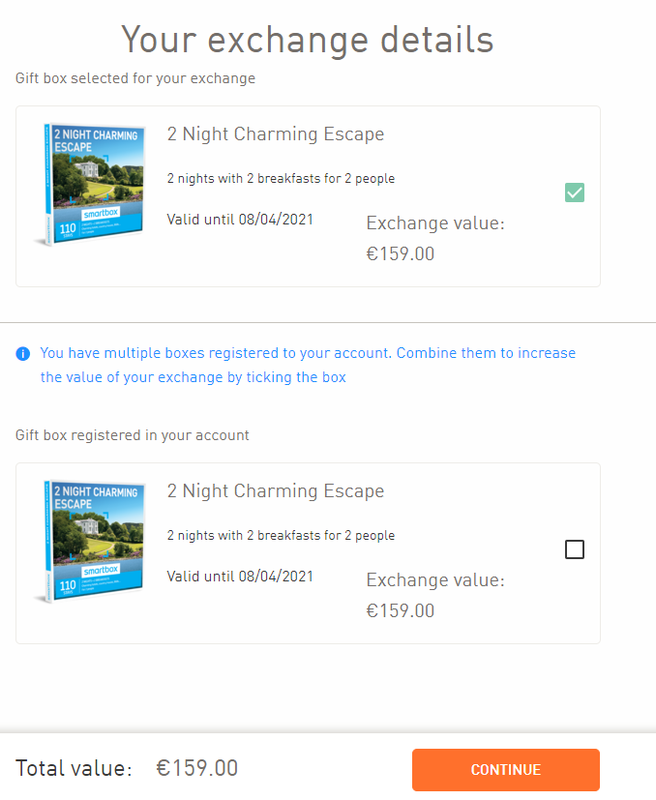 Click the Combine boxes button at the top to add more vouchers to your exchange. Tick the box for the vouchers you wish to exchange. The value of the exchange will increase as multiple boxes are selected. Once you have selected all gift vouchers you wish to exchange, click Continue. Select your new gift voucher and click Exchange for this gift voucher. To complete your exchange, select the type of voucher you prefer and specify the shipping information and payment details (if required). How do I exchange or renew my gift box? The easiest way to exchange or renew your gift box is online via your personal account. If you haven’t done so already, you will need to register your gift box to a personal account. Once registered, simply navigate to the My Gift Vouchers section of your personal account where you can begin our simple three-step exchange process. Once complete, you will receive an email detailing your exchange. If you selected an e-Box , you will receive a second email within 30 minutes that will include your new e-Box . If you selected a physical box, it will be delivered according to your chosen delivery method. If your gift box expired less than 6 months ago, you can still exchange it online but a fee of €10 will be applied. If your gift box expired more than 6 months ago, it’s no longer possible to exchange your gift box. We’re sorry but it’s not possible to exchange to a gift box of lower value at this time. We do however have an extensive range of gift boxes that are available to you as part of our exchange process. To view a full list of available gift boxes, please log in to your personal account and begin the three-step exchange process. Can I see what experiences are available in a new box before I make an exchange? Yes. As part of the exchange process, you will have an opportunity to browse all boxes available to you. To see a full list of the partners available in each box, just click on the box entry. I exchanged my gift box – why is my new gift box not in my personal account? Even though you completed an exchange, you will still need to register your new gift box to your personal account. If you selected an e-Voucher, you will receive an email within 30 minutes of your exchange that will include your new e-Voucher. You can use this information to register your new e-Voucher to your personal account. If you have already received this email, click here to register your gift box. If you selected a physical box, you will need to wait until your gift box arrives before you can register it to your personal account. I didn't receive my new e-Voucher, what should I do? You should receive your new e-Voucher via email within 30 minutes of completing your exchange. If you don’t see it, please check the junk or spam folder in your email account. If you don’t receive the email within 30 minutes, you will find details of your new e-Voucher within the Orders and Changes section of your personal account. You can use this information to register your new e-Voucher to your personal account. I regret exchanging my box, what can I do? With Smartbox exchange is unlimited so you can change your gift box multiple times until you find one that you are happy with. If you exchanged your gift box for one of higher value, you have the right to return it within 14 days. Please contact Customer Service for more information. What payment methods are available if I choose to upgrade my box? We currently accept exchange payments via Visa and MasterCard. It's not possible to use PayPal or request an invoice during the exchange process at this time. Why should I create a personal account? Go to your personal account log-in page and click on the link Forgot your password? I want to delete my personal account. What should I do? You can delete your personal account by sending your request via email to dpo@smartbox.com including your full name and the email address associated with the account. For security reasons, please also include a scan or photo of your photographic ID. Please note, once your account is deleted it cannot be reactivated. Information and assets, including registered gift boxes or orders associate with the account, will no longer be available. I don’t want to receive communications from Smartbox. What can I do? Click the ‘Unsubscribe’ link you’ll find at the bottom of all promotional emails you receive from us. You can also send an email detailing your request to info-ireland@smartbox.com. You have not found the answers to your questions? Our customer service is at your disposal to help you. I would like to extend my getaway, can I reserve extra nights?